Maurizio Sarri is confident Bayern Munich target Callum Hudson-Odoi will be at the level Chelsea require in "one or two months". Chelsea are hopeful the 18-year-old will sign a new contract at Stamford Bridge, but Bayern have made no attempt to hide their interest in a player they have reportedly tabled three bids for. 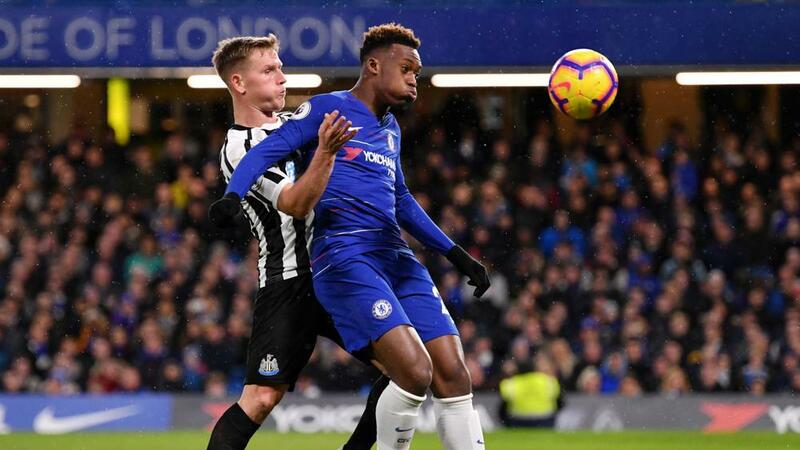 Sarri accused the Bundesliga champions of a lack of professionalism over their pursuit of Hudson-Odoi, who came on as an 81st-minute replacement for Pedro in the Blues' 2-1 win over Newcastle United on Saturday. The Chelsea head coach denied his bench lacks depth, though he admitted the lack of a back-up for Jorginho is a concern following Cesc Fabregas' move to Monaco, and thinks Hudson-Odoi - who is understood to be eager for more playing time - can develop into an important squad player. "The bench is not very short. It has been left short in only one position at the moment because I think that Hudson-Odoi is improving," said Sarri. "Hudson-Odoi in one or two months will be at the same level as the other players." Jorginho's forward passing lacked accuracy in the first half and Sarri admitted Fabregas would have been brought on for him in the second half had he not left the club. Sarri wants a specialist in the role at the base of midfield but suggested Ethan Ampadu, who can also play at centre-back, could be that player with some hard work. "I hope the same [as Hudson-Odoi] for Ampadu. Of course, for playing as a central midfielder in our team is not easy," said Sarri. "We need to try and try and try in training with him. I think that he is able to do it. "The player who plays in that position usually touches the ball about 120-130 times and so I think that we need a specialist there."